After a run down nearby Copeland Creek, Tim and I decided to explore the lower part of Rock Creek on the way home. The gauge at Steamboat creek was at 3500 and rising fast, so Rock Creek was really booming. The weather was really nice, in the mid fifties and pretty clear though it was starting to get dark. Mike took off immediately because he had some engagement to attend to, and Tim and I took a leisurely drive back down the North Umpqua. We drove over Rock Creek on the way home (it is a trib of the N. Umpqua) and it was looking big, muddy and mean- of course we couldn't pass it up! We hiked up a bit and found a fish hatchery and above this a likely put in below a low head dam. We talked to the people that worked there and they said it was no problem if we wanted to stage from there. It was getting dusky so we parked the car and got ready. At this flow the creek was filled with beefy, unfriendly holes and though it looked big we knew it would seem a lot bigger once we got on it. The trickiest section was to be the 'man made gorge'- a narrow section made a bit tighter by a man made wall on river right. This section had two really big, nasty holes, and we had to avoid them at all cost because below them was a quarter mile of big boulder strewn class IV water- a swim would be really bad here. The fish hatchery employees gathered on the bank- I think they were a little unnerved that we were going to run this section. Tim drags his boat up past the 'man made gorge'. Our put in was about a quarter mile upstream from here at the base of the low head dam. Good whitewater in there..
We put in and we were off like a runaway freight train- We shot into the gorge and I ferried furiously to the right, missing the really bad hole... The water was so big and pushy it was disorienting, but big fun! I knew from our scout that I had to stay generally right, but I was having a hard time seeing what was downsteam- it was a crazy ride! I crested a wave and saw Tim get swallowed up by a huge hole and pop out the other side upside down- "Don't want to go there" I thought as I paddled furiously to the right. I blasted around a rock and was suddenly tossed into the middle of the river- one of the holes had me.. I paddled frantically but was suddenly sucked 6 feet back upstream like someone had tied a rope to my boat- I plunged backwards into the hole and immediately spun sideways and spent the next 10 or 15 seconds in a wild, out-of-control sidesurf. I finally managed to work my way to the weak side of the hole and then out but I was a little gripped after that- I have never been pulled backwards so far so fast! Here's a pic of the hole that I was stuck in for awhile... When I took this picture we were dragging the boats up and I was thinking- don't want to end up in that one! I guess the moral of the story is: always bring headlamps! 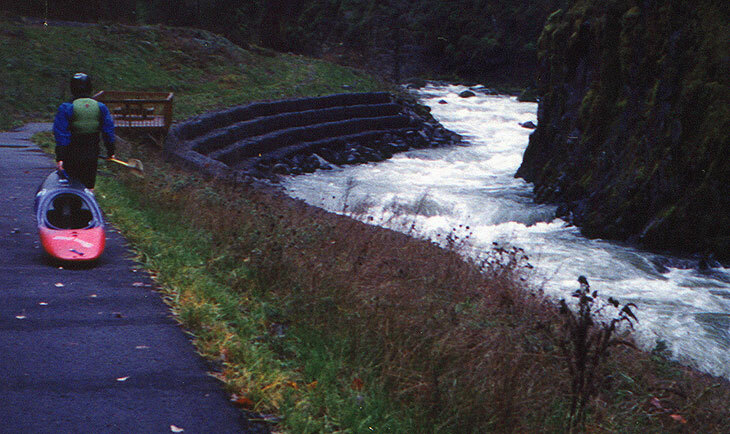 Lower mile of Rock Creek, 17 December 1999.